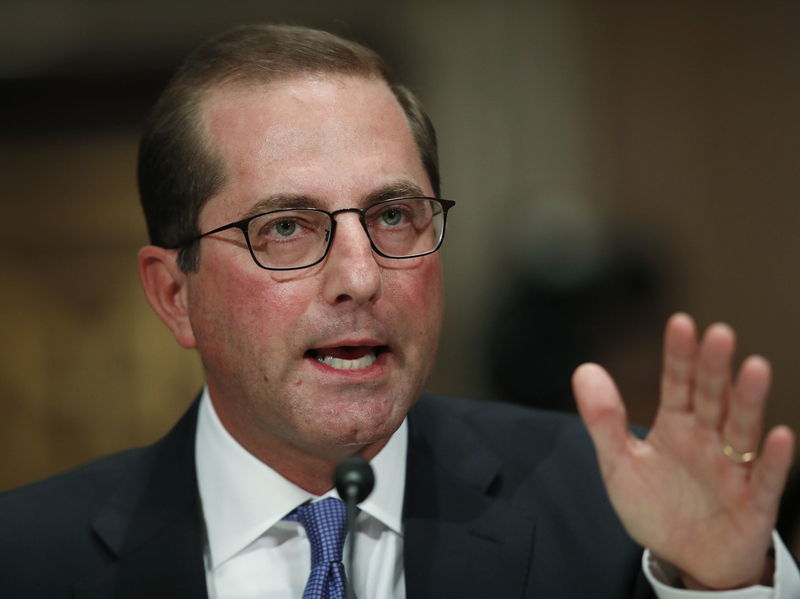 Alex Azar Confirmed As HHS Secretary : Shots - Health News Alex Azar spent five years in charge of Eli Lilly & Co.'s U.S. operations. During his tenure, the prices for the company's insulin products more than doubled. Alex Azar will take over the Department of Health and Human Services at a time when rising drug prices are a huge political issue. He'll take over the agency at a time when rising drug prices are a huge political issue. Azar acknowledged as much in his confirmation hearing in early January. He told members of the Senate Finance Committee that dealing with high drug prices would be a priority. But Azar won't have the power to get Congress to change the law to let Medicare negotiate prices directly with manufacturers. He told senators that allowing the insurance companies that contract with Medicare is more effective. "These are incredibly powerful negotiators who get the best rates available," he said. Azar spent five years at Eli Lilly, which makes several blockbuster medications, including Cialis, which treats erectile dysfunction; the antidepressant Cymbalta; and several forms of insulin. Insulin prices have drawn particular fire because they keep spiraling higher, even though insulin has been around for almost a century. Before his stint at Eli Lilly, Azar served in HHS under President George W. Bush, so he is familiar with the sprawling agency that also includes the National Institutes of Health, the Indian Health Service and the U.S. Public Health Service. Azar replaces Tom Price, who resigned from HHS in September after a Politico investigation found that he had taken private charter aircraft on work-related trips at times when cheaper commercial flights were available.